O/o Deputy Commissioner, Kamrup Metropolitan District. 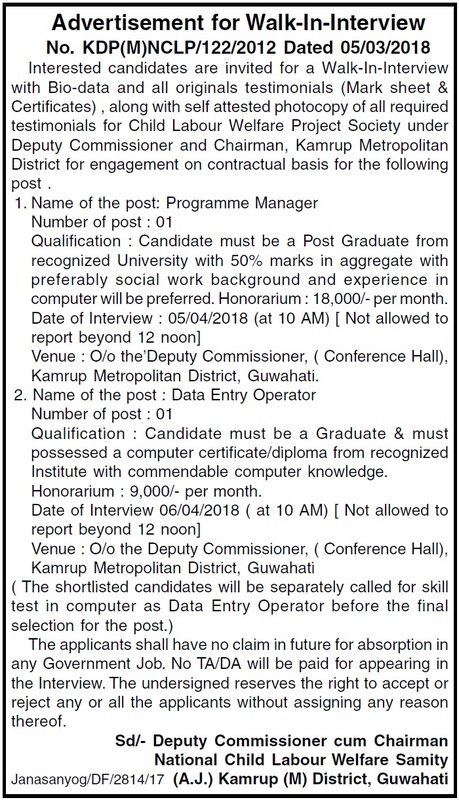 Interested candidates are invited for a Walk-In-Interview with Bio-data and all originals testimonials (Mark sheet & Certificates) , along with self attested photocopy of all required testimonials for Child Labour Welfare Project Society under Deputy Commissioner and Chairman, Kamrup Metropolitan District for engagement on contractual basis for the following post . Educational Qualification : Candidate must be a Post Graduate from recognized University with 50% marks in aggregate with preferably social work background and experience in computer will be preferred. Honorarium : 18,000/- per month. Venue : O/o the’ Deputy Commissioner, ( Conference Hall), Kamrup Metropolitan District, Guwahati. Educational Qualification : Candidate must be a Graduate & must possessed a computer certificate/diploma from recognized Institute with commendable computer knowledge. Honorarium : 9,000/- per month. The applicants shall have no claim in future for absorption in any Government Job. No TA/DA will be paid for appearing in the Interview. The undersigned reserves the right to accept or reject any or all the applicants without assigning any reason thereof.